UCS | Charu Dhumne - Universal Consulting Services Inc.
Charu Dhumne is the owner and President of UCS. In her position, Charu manages strategic recruitment and identifies new corporate opportunities. She also leads the Human Resources, Finance, and Corporate Operations functions. Charu possesses management consulting and industry experience, with specific expertise in e-commerce and systems integration. 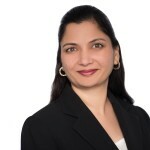 Charu previously worked for IBM (PwC Consulting, Coopers & Lybrand), Infobranch, PEC Solutions, and Synectics. Charu holds a B.E. in Electronics Engineering from Nagpur University, Nagpur, India.